Home » Uncategorized » The Quote Challenge – Day 2 – Do you value time? The Quote Challenge – Day 2 – Do you value time? 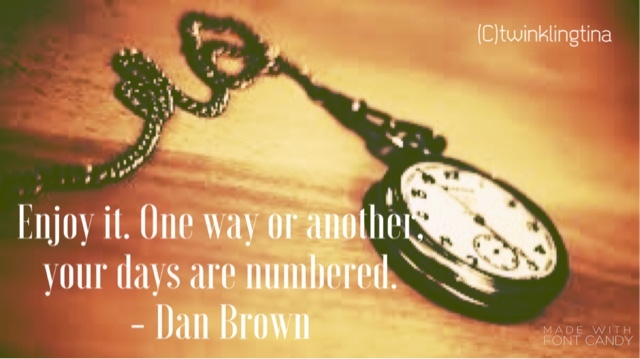 So it’s Day 2 of The Quote Challenge and today I’m going to share a quote by my favorite author Mr. Dan Brown. I almost worship him and have read all his works. So today’s quote is from the book Inferno. And I feel it’s quite an apt quote which is pretty true for life. Here’s the quote – and it’s so true. Enjoy. 1. Post a favorite quote of yours for 3 consecutive days, obviously a different quote each day from any book, any author of your choice. It could also be your own quote. Hope you guys have fun with the challenge! 6 Comments on The Quote Challenge – Day 2 – Do you value time? Thank you for the nomination, Tina. I'll see if I can work quots into my views on news. hehe. Thanks for the nomination, Tina! Love the picture and quote!